Despite the fact that I am not very happy with the burnt coconuts bits on top of the muffins, I got encouragement from Facebook Group members to issue the recipe and most of them wouldn’t mind the burnt coconuts.. Actually, the brownish colour on top of the muffins is a combination of both the burnt coconut and the palm sugar that oozes out from the muffins. 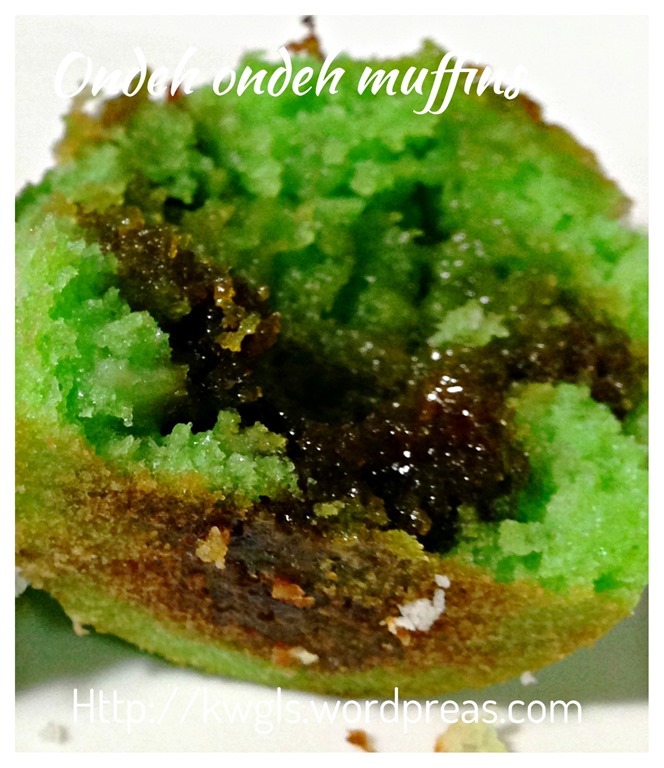 I concurred to issue the recipe as it is a nice, aromatic and moist muffin. Most important of all, it really taste like ondeh ondeh.. 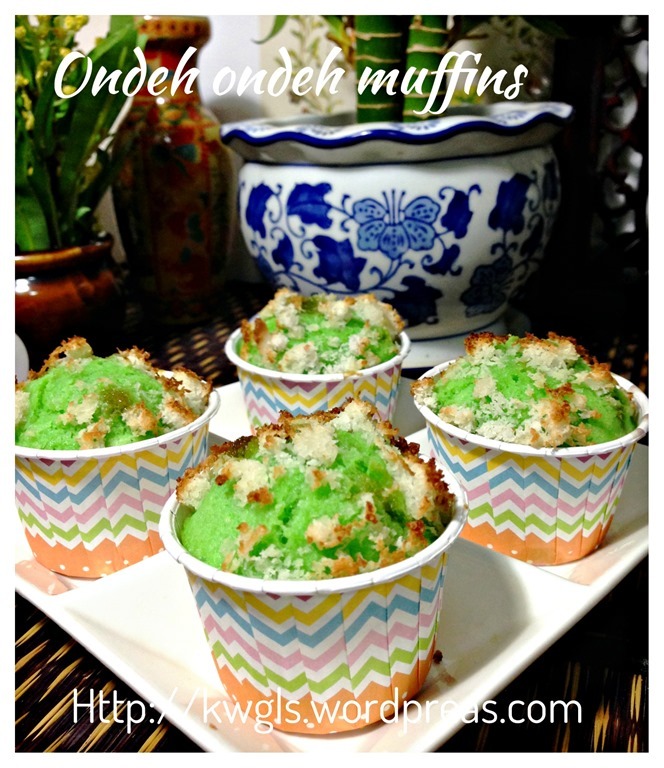 I can’t claim that the concept of transforming the kuih into a Western muffin or cupcake is an idea of mine.. 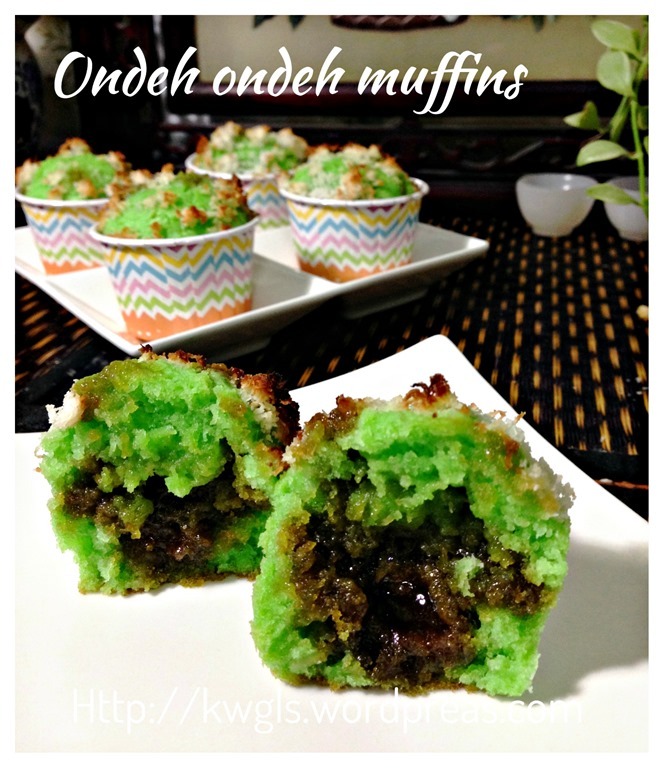 I remembered one of my friends have asked me many many month’s ago about this cupcake..She said she had seen such a cupcake and whether I know how to prepare it… Without doing any research, I told her it should not be difficult to replicate the concept of ondeh ondeh in a cupcake.. I totally forgot about this until on Sunday when I was shopping with the family members and saw some stores selling the traditional ondeh ondeh. It suddenly reminds me of this experiment that I wanted to try. I rushed to the supermarket, grab a bag of freshly grated coconut and “chase” my family members to go home earlier so that I could prepare this special breakfast for them.. 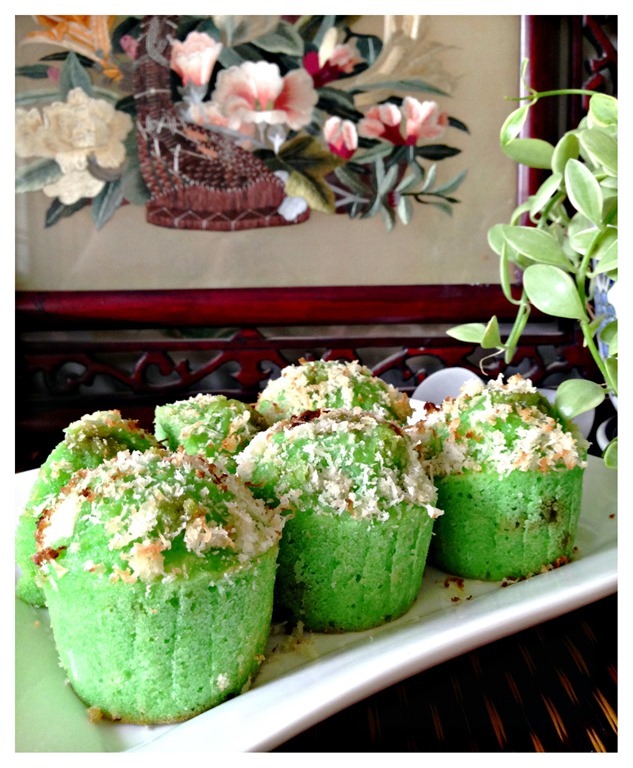 This recipe is a recipe of my own and modified from one of my favourite muffins: Start The Year Of Horse With Some Delicious Coconut Muffins. . 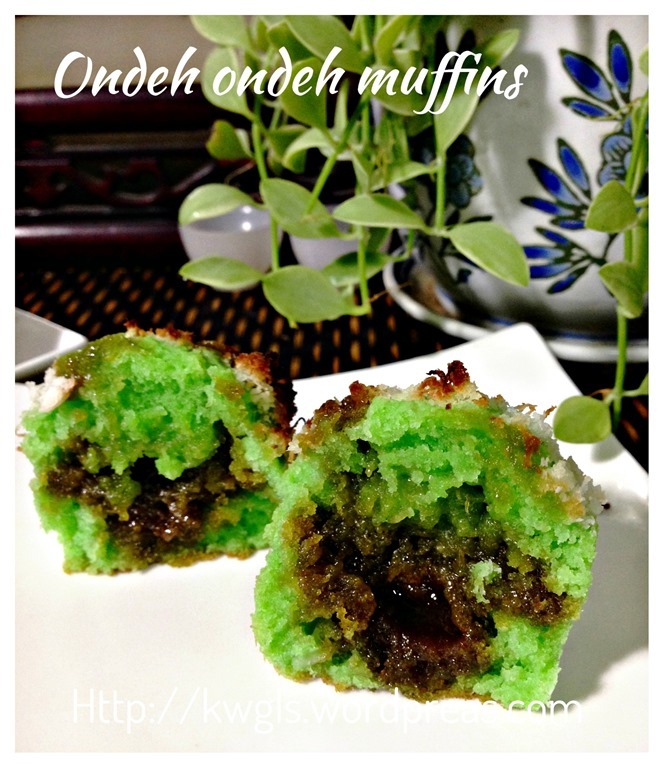 In order for the muffin to look like an ondeh ondeh, I have resorted to the use of Pandan paste and putting some palm sugar inside the muffins. I have also dusted the muffins with some freshly grated coconuts which I think is not advisable to do since it is very easy to get burnt (unless it is prepared with desiccated coconut) . 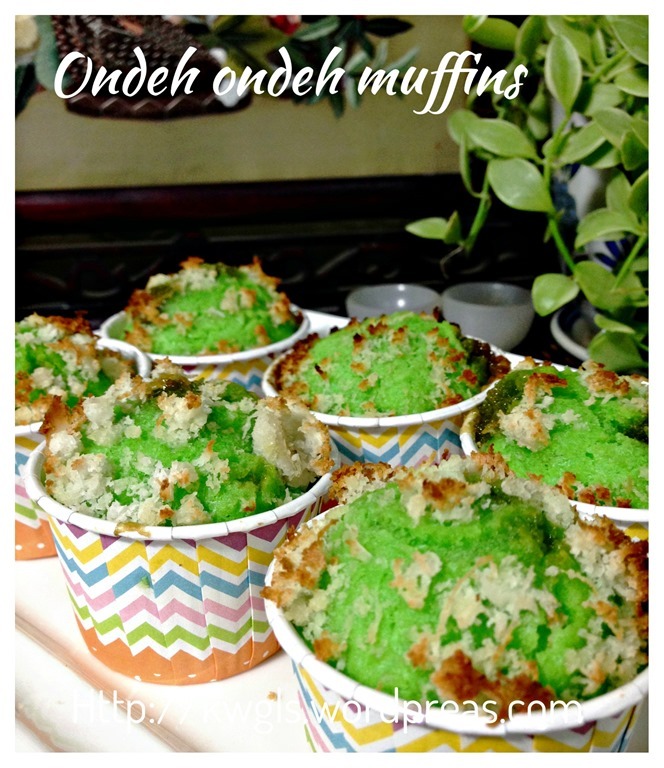 Alternatively, like ondeh ondeh, the muffins can be served with freshly grated coconuts instead of baking together with the muffins. Taste is awesome. As expected, the palm sugar did not oozes out like the real ondeh ondeh but it did melt inside the muffins and in the surrounding area where the sugar melted, the taste is divine..One word of caution, the cake is like a volcano, the hot melted sugar syrup is looking for any tunnels to flow such that the pressure will not build up inside the cake. Therefore, positioning of the sugar in the centre is of paramount importance such that leaking can be reduced to the minimum. 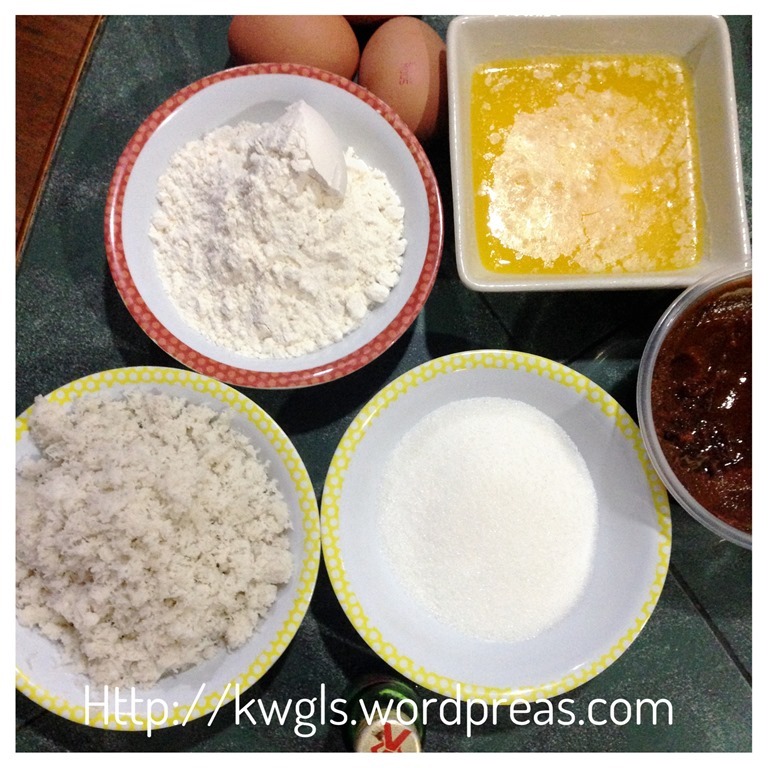 In a big mixing bowl, put castor sugar, freshly grated coconut, salt and self raising flour. Use a spoon to stir until it is well mix. Make a well in the centre and set aside. Fill your baking cups with about 1/3 full, put a small piece of palm sugar (in this illustration, I used Gula Apong) on the top of the batter as centre as possible. 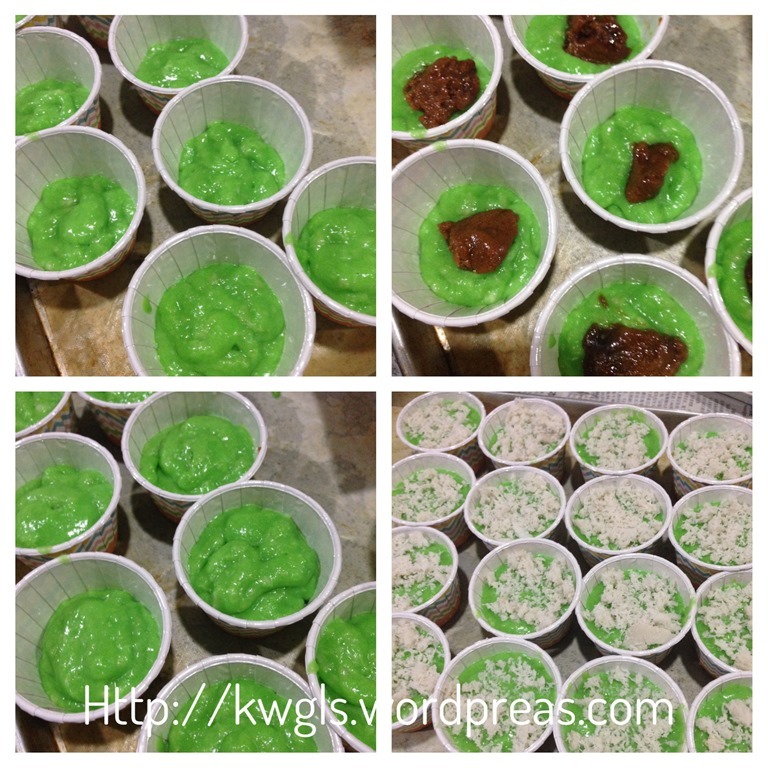 Cover the palm sugar with additional batter until it is about 2/3 cup full. Dust with additional freshly grated coconut if desired. Bake in the pre-heated oven of 180 degree Celsius for 15-20 minutes (for small muffin cups) or 20-25 minutes (for normal muffin cups). Use a skewer to insert at the side of the muffins and ensure that the skewer comes out clean. Best served warm with additional grated coconuts. 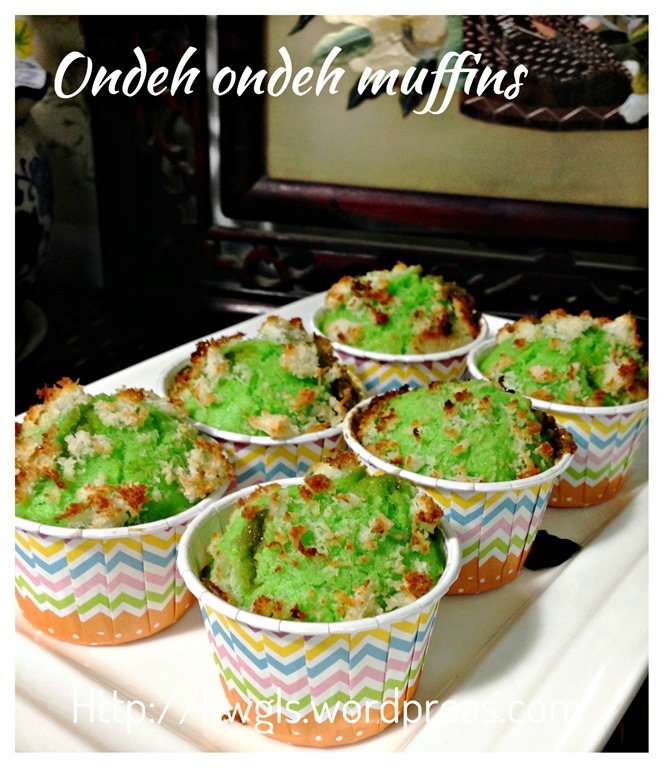 I have no regret of making this batch of ondeh ondeh muffins. It is aromatic and taste very close to the real ondeh ondeh. What make me happy is that family members like it… the reason is simple, because it is moist, coconut flavoured and slightly sweet because of the melted palm sugar. If you do not like the coconut inside the muffin, you can always use this sweet potatoes muffin as the base. Remember, if you do not want the burnt bits of coconut on top of the muffins, just roll the muffins on top of some freshly shredded coconuts before serving. 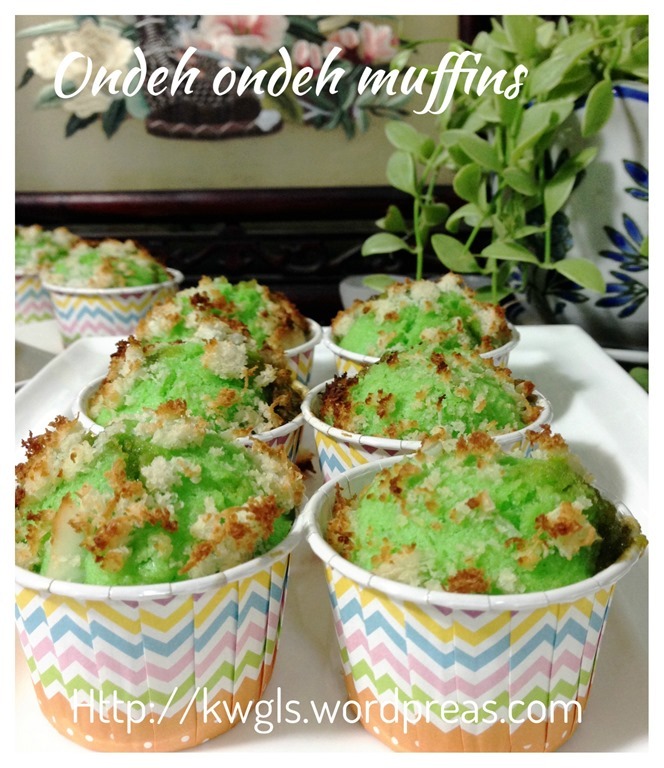 This entry was posted in Cakes and cookies, Chinese and Asian Cakes and Snacks, Desserts, Food Preparation Series and tagged 8, GUAI SHU SHU, Guaishushu, kenneth goh, keplon muffins, onde onde cupcakes, ondeh ondeh, Ondeh Ondeh Muffins, postaday. Bookmark the permalink. You know what intrigued me about this muffin? 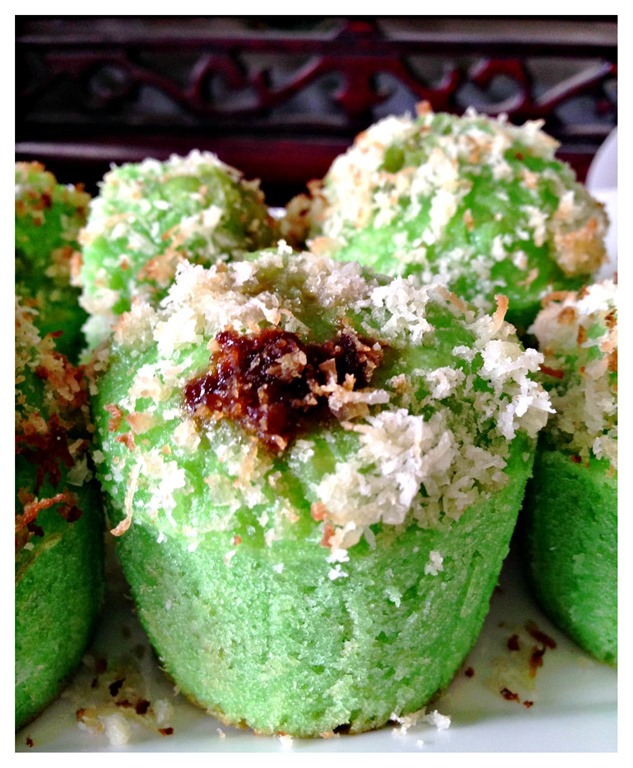 Its the palm sugar filling inside….I know it must be delicious. I would love to give this a try. Hi Kenneth! This is very innovative. Kudos to you. May I ask if its better to store them in the fridge on the same day since it has coconut content ? Thks. Just sharing a similar idea I saw on reddit a couple of weeks ago, however she used a buttercream frosting instead. Hi Kenneth, I just tried making this. 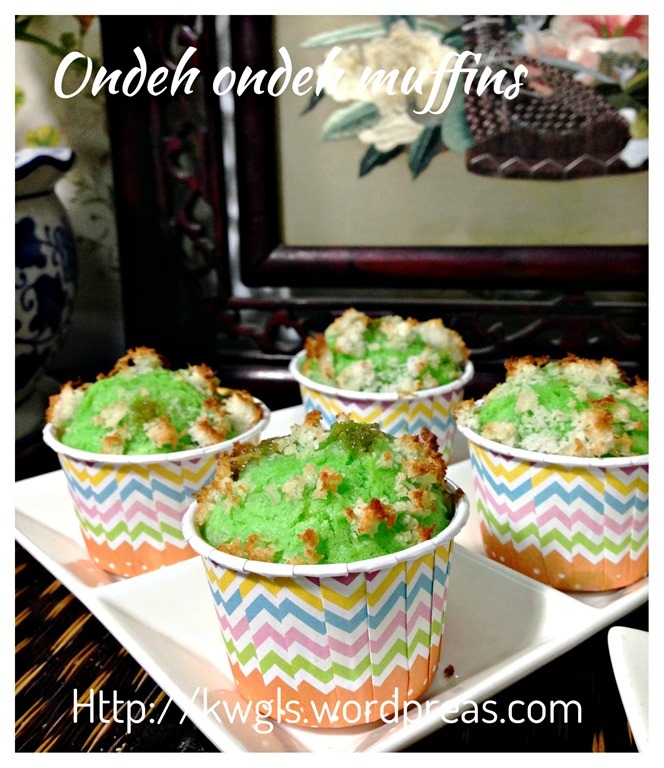 May I know if the texture is supposed to be dense n heavy like kuih or soft n fluffy like muffin? My texture is dense n heavy. Took a picture but can’t attach it here to show you. If it is dense and heavy , sign of over mixed . I am very keen to try this recipe. However, I would like to use fresh pandan juice. As I am a beginning baker, I am unsure about what amount to use. Would you be able to help me out? Thank you so much. 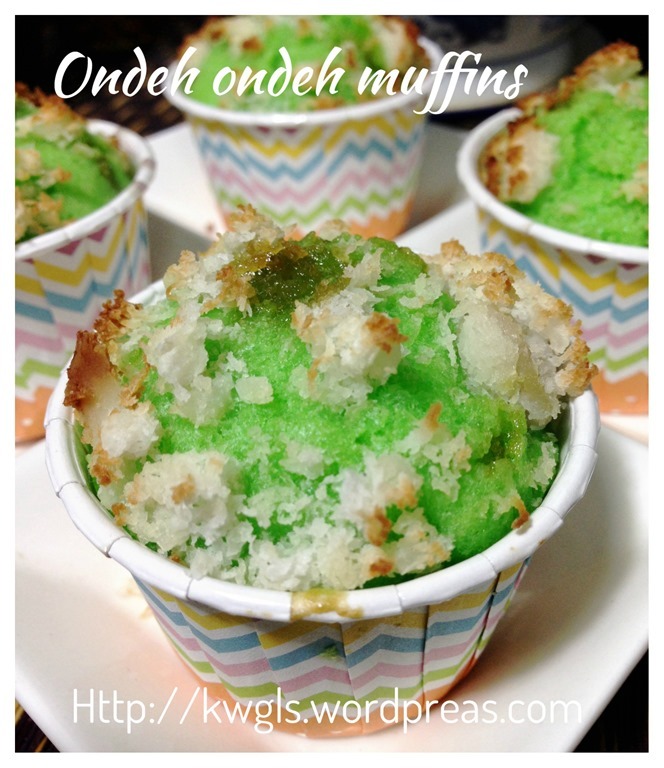 Hi, Kenneth, I’m a big fans of onde onde, so I have tried your recipes. The cake tastes good but my gula melaka filling doesn’t melt much, still left quite a bit solid. Hi Kenneth. I really love gula melaka. But my friend told me that it is ‘dirty’. She say need to sieve and a lot dirty residue can be removed. But if I do that, I can’t use it for recipe as it becomes liquid. What should I do? Or the gula melaka actually can just rinsed and then eat. Haha I have eaten a lot without sieving. 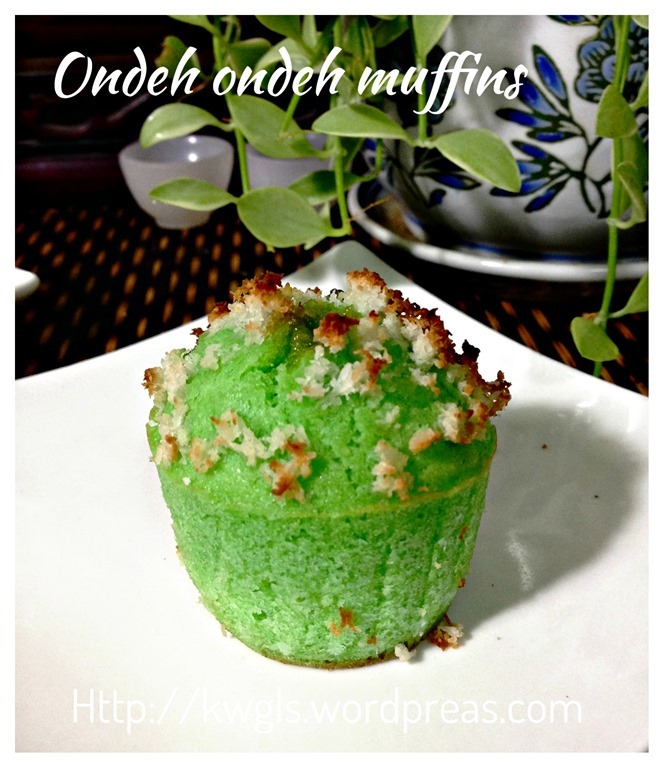 Hi Kenneth, I try make this onde muffin but turn not so nice like yours. What make your muffin look blooming up? you put baking powder..? What I have done is what I stated in the recipe. If it is chewy, chances are you have over mixed and gluten developed . 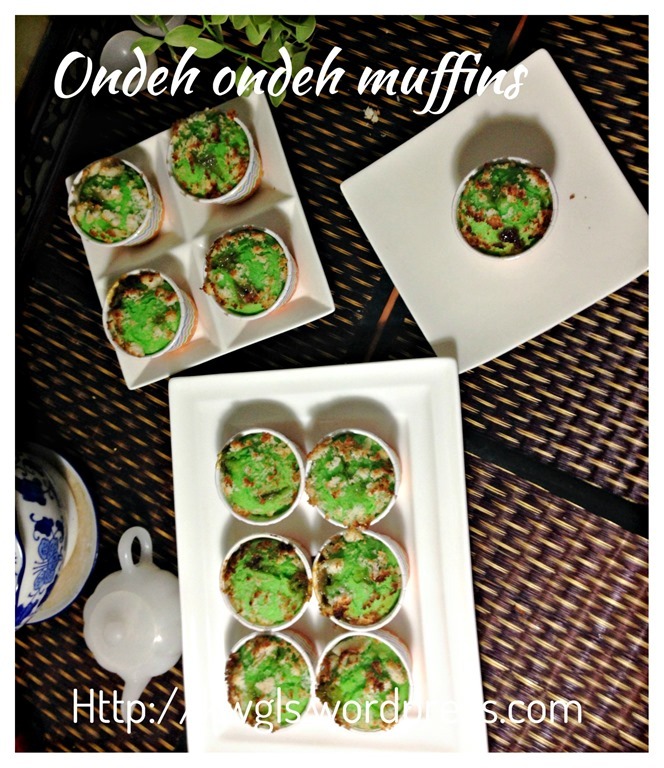 Tq so much for the ondeh ondeh muffins recipe. Baked them today, oh my it’s yummy! So happy to hear this..
May I know how should I adjust the baking time? Longer or higher temperature? Any idea what I should do, based on your experience? I do not think it will work .. 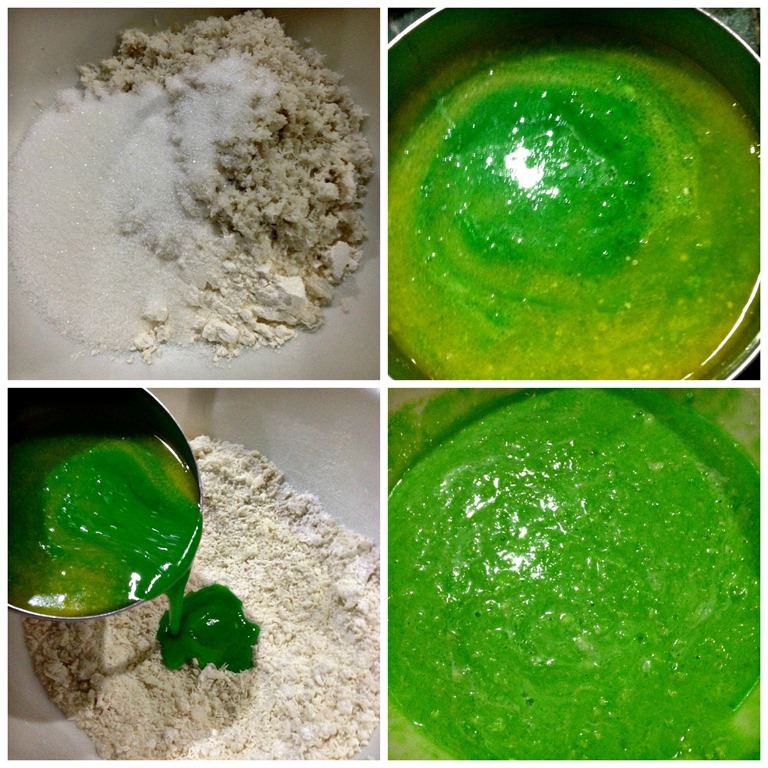 Your cake will be very sweet and damp without enough batter to support it ..